It’s one of those funky looking walrus things from the Howling Fjord! Technically, it’s a Reef Cow. It’s still an ugly as sin animal that has no place being sculpted, but that’s just my opinion. That’s not even the real issue here. Let me explain my real problem with this statue. Dalaran is a city-state that once rested at the base of the Alterac Mountains along the shores of Lordamere Lake. In a predominantly human (now also forsaken) region. The story goes, or so we’re told, that after its destruction at the hands of Archimonde, Dalaran popped inside a pink bubble and starting to rebuild. In my head, I always pictured it like in the Harry Potter movies, where the destruction goes in reverse until everything is back to normal – but they probably rebuilt it the normal way. My understanding though was that after the reconstruction was complete, they moved the city to Northrend. Am I alone on this? Because I am very curious about why there is a sculpture of an animal that is native only to Northrend in the reconstructed Dalaran. Did they get some wild eyed sculptor from the Howling Fjord to travel all the way back down the Alterac just to do this statue? Were they just so captivated by this creature that they just had to immortalize in stone for all mages to see? I can’t imagine anything else! Either someone who had studied reef cows made this monstrosity of stone before the city was moved, or the mages of Dalaran got to Northrend, decided the fountain needed some pizazz and saw a reef cow and thought that thing best represented the beauty of the floating magical city. While we’re on the note of this weird sculpture, why is the reef cow eating frenzies? There are no frenzies in the Howling Fjord! 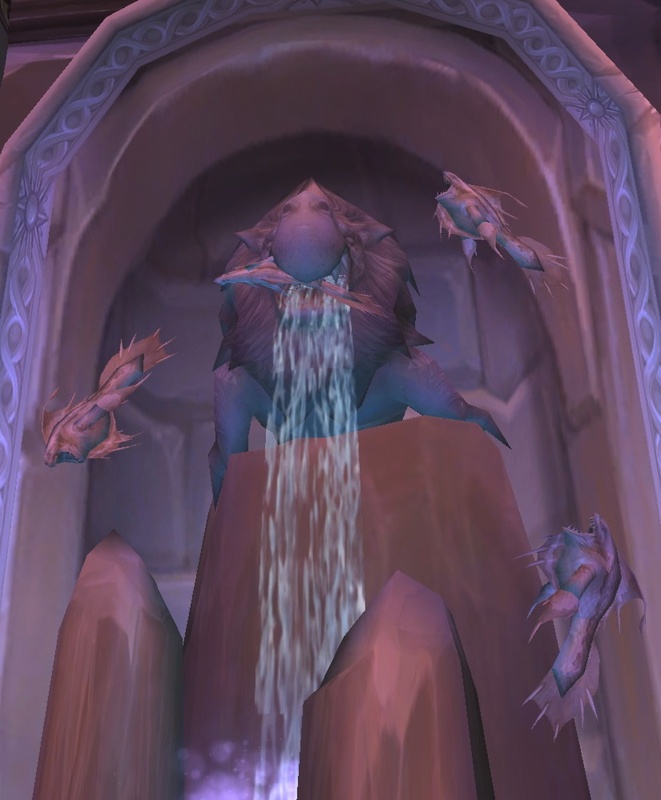 The only place in Northrend where frenzies can be found is in the Sholazar Basin (which would lead me to take a guess that maybe the titans had a hand in creating these psychotic killer fish… still no clue how they ended up in the Serpentshrine Cavern though.) But there are no reef cows in the Basin. There are no reason these two species to even have come into contact, and based on my past experience with frenzy fish – the damn walrus should be DEAD. Just a skeleton, not even a speck of meat left on those bones. If anything this just further solidifies the idea that the mages of Dalaran are all completely insane. They’re friend their brains on sucking up arcane energy and this is what we get. When the next generation of mages arrive to study the craft, they’ll be looking at this statue like we look at what our people considered art in the 1960’s. The ugly walrus statue will be the tie dye of the wizard society. Posted on June 30, 2010, in Northrend, Oddities and tagged eventide, fountain, reef cow, walrus. Bookmark the permalink. 4 Comments. Perhaps the statue is magically enchanted and has changed form to reflect the form of the local fauna. Whilst in Alterac it was a giant turtle flailing at Murlocs. But then the question arises…. WHY? Ok scrap that theory. The mages are crazy. Great rant as ever Vrykerion. .-= Wulfy´s last blog ..Portals to Other Worlds =-. People in ‘Lower Azeroth’ know about Northrend animals too, I expect. Maybe there are even menageries in some places. .-= Pai´s last blog ..Blizzards RealID =-. Possible. I always got the impression that Pre-WotLK there was never a serious attempt to establish a foothold in the frozen north, only a few choice expeditions, such as the Bronzebeard expedition, and Arthas’ psycho jaunt up north. But even if they are familiar with the reef bulls… Why reef bulls? There has to be something more majestic, or at least less ugly, to put there.